All transactions are safe and secure with a reliable history in online purchasing behind each of our associates. 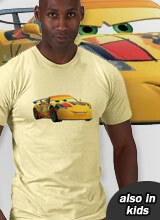 Buy the Cars 2 Miguel Camino t-shirt to own Cars clothing and merchandise. One of the most attractive looking cars at the World Grand Prix, Miguel Camino wears the colors of the Spanish flag, the country that he calls home. This Disney Cars t-shirt features the up-and-coming racer who first grabbed his country's attention by participating in the Running of the Bulldozers and then as a successful toreador in the dozer ring. Devoutly supported by his hometown of Pamplona, Miguel wants to turn a few more headlights at the World Grand Prix. Support the stylish showman with this Miguel Camino shirt that is also in kids' sizes. In addition to the Cars 2 Miguel Camino tee above, browse the Cars Clothing Gallery for more apparel like men's and women's clothes, kids shirts or hoodies.